Kleefeld on Comics: Creator Approved? The figure pictured here is a child's toy from the 1920s. It's based on a popular (at the time) fictional character. Now, obviously, plastic wasn't around to make children's toys out of, so this is made of wood and string. As such, there are some obvious limitations in the materials and it's not going to be a spot-on representation of the character. I mean, it's pretty hard even today, almost a full century later, to render a two-dimensional character into a three-dimensional figure and maintain a high degree of accuracy. Especially when you get nuances of line movements that are unique to the original creator -- think of the slightly wavering pen lines of late period Charles Schulz that NEVER got translated into any Peanuts figures. Now, this partciular figure appears to be an animal of some kind. It's got a long snout, what appear to be ears on the top of it's head, and a tail. But it still takes on the basic upright human form. The paint suggests either a coat or perhaps a lightly colored chest. The arms are short and stubby, and the feet appear to be pretty large. There's also a long, skinny neck. I'm assuming Herriman didn't actually see, much less sign off on, a prototype. I half-wonder if these were even produced legally. 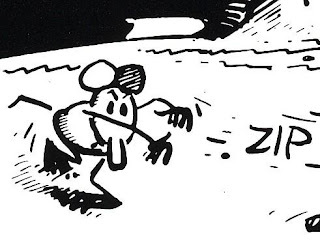 Regardless, who thought this looked anything like Ignatz. Honestly, it looks more like Krazy Kat to me! Tie a small piece of red ribbon around his neck and you're WAY closer to Krazy than Ignatz. I mean, wow. I see almost no resemblance to Ignatz at all here! Yeah, I know the materials weren't the most ideal for rendering a character like that, but holy cow, is that bad!